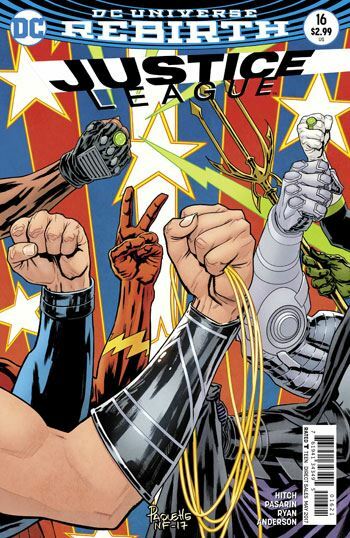 Now that Justice League of America has launched, I thought it was worth taking another look at the Justice League book. 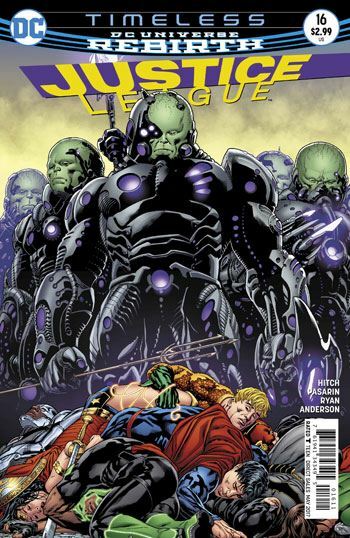 Issue 16 is the second part of he Timeless storyline, which has seen members of the League scattered to different eras in the past and future. Superman and Batman are outside the effects that have sent the other members away. They spend much of the issue trying to get some clear, straight answers from a group of scientists who have been shielded. They don’t really get any. Even the use of Brainiac 5, another Legion of Super-Heroes tease, in the Cyborg thread didn’t really grab me. Though I concede it’s the most interesting part of the story for me. I love the art. Every page. It all just looks fantastic. So why isn’t that enough to at least carry me through the tale? It has been, in other cases. Which each issue of this book I find the dialogue flat, and the pacing tedious. And it’s just not getting better. The new Justice League of America series just really goes to show how unexciting the Justice League book is.